The retail industry will undergo fundamental and drastic changes in the next decade as it continually strives to keep pace with today’s rapidly changing consumer. Consumers are more informed, connected and empowered than ever before. As a result, their expectations and demands are rapidly rising and will only continue to accelerate at unprecedented rates in the future. Technology has been the primary enabler of this consumer change and has profoundly impacted the way products are bought and used around the world. The stakes are high for retail businesses. Over the next decade, digital innovation in the consumer industries could create an estimated $10.3 trillion of value ($4.9 trillion through value addition [new sources of operating profit] and value migration [shifts in existing ones] for the industry itself, combined with $5.4 trillion for customers and society). To secure a portion of this value and stay relevant to consumers, retail companies need to look beyond traditional ways of operating. 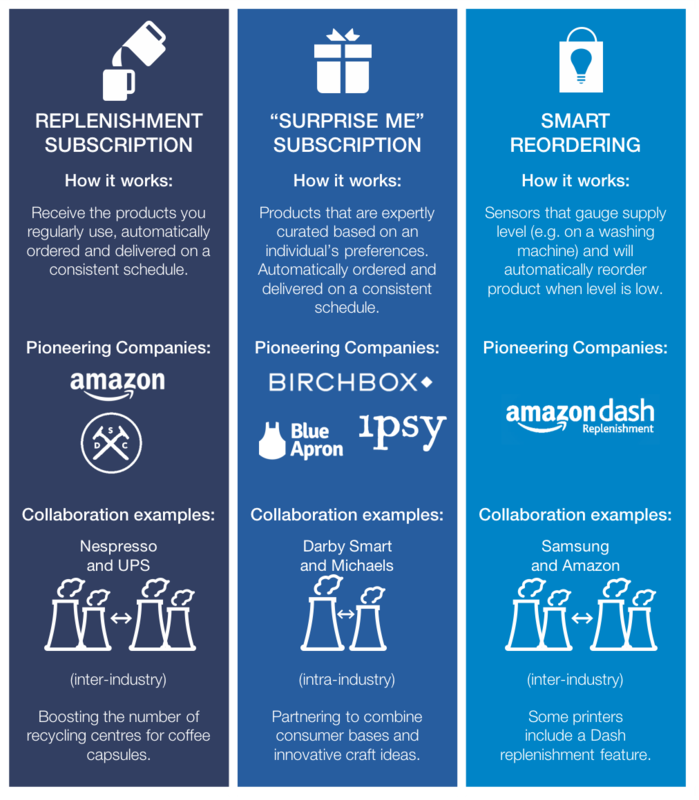 Emulating emerging business models and finding ways to collaborate with partners both inside and outside the retail industry will be critical. Historically, brick-and-mortar retail stores have been the dominant business model in the retail industry. While it is expected that physical retail stores will continue to have a presence in the next 10 years (although their function may shift from a purchase channel to an experiential channel), emerging business models are growing quickly. Six models, in particular, (see graphic below) are likely to become more prevalent in the retail industry in the next decade. These emerging models work because they connect with consumers and meet their needs. They offer the consumer experiences and/or services that provide value in the form of convenience, variety or affordability – all at the touch of a button. Given the positive consumer response to these emerging business models, retail companies need to continuously assess their position in this more dynamic industry environment. Interestingly, intra-collaboration is a somewhat counter-intuitive partnership model, because it requires cooperation between companies that historically have viewed one another as competitors. A recent example is Darby Smart, a leader in online crafts that offers subscription DIY craft boxes, and Michael’s, the world’s largest arts and crafts retailer. They created a partnership so Darby Smart will gain access to Michael’s consumer base and a wider range of craft categories, while Michael’s will benefit from Darby Smart’s on-trend crafts and online community. Together the two companies, who were once competitors, will now offer stylish, creative projects to a broader audience. As retailers think outside the (brick-and-mortar) box and look for opportunities to partner in a rapidly evolving retail landscape, the societal impact cannot be underestimated. Changes to the workforce, the urban landscape and the environment will be some of the most significant impacts. If the future of retail is built on collaboration, organizations and groups focused on these societal impacts will become woven into the collaborative systems that develop. Over the next decade, strategic partnerships, in their many forms, will become the key to successfully unlocking the value for the industry, consumers and society that can be created through digital innovation in the retail ecosystem. The Digital Transformation Initiative will be publishing its report into digitalization in retail later this year. The latest news and research from the initiative can be found here .